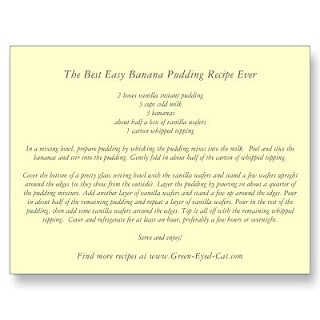 I love the recipe cards on Zazzle! 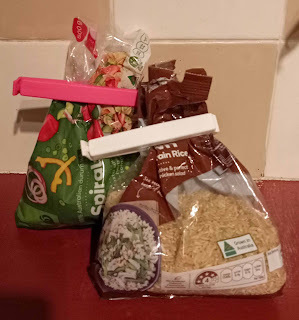 The recipes are awesome, of course, but I love being able to purchase the recipes printed on postcards with the photo of the prepared food on the front. 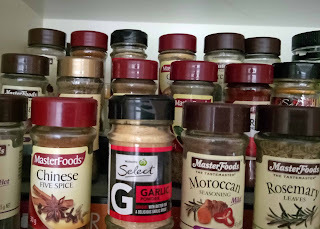 They are especially great when they are associated with articles with lots of photos or videos of the recipe being prepared. It is really cool to discover a new recipe online and to also be able to purchase the recipe card for my own personal recipe binder. Because these recipe cards are professionally printed on heavy weight card stock with glossy photos, they also make a lovely presentation suitable for gift giving. Wouldn't they be perfect for a new bride or someone setting up their home and kitchen for the first time? 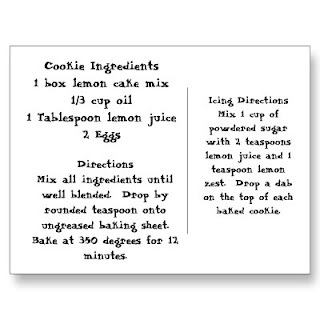 Here are a few of my personal favorite recipe cards from Zazzle. 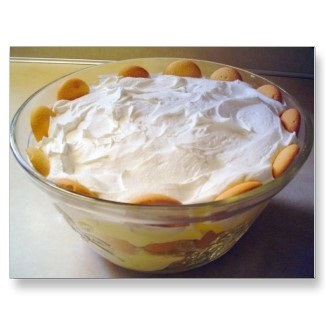 Banana Pudding is one of my favorite desserts! My own mother makes a banana pudding for me every year for my birthday because I actually prefer it over a birthday cake. Mom usually cooks her pudding, but Susan offers a faster, easier way to prepare Banana pudding. 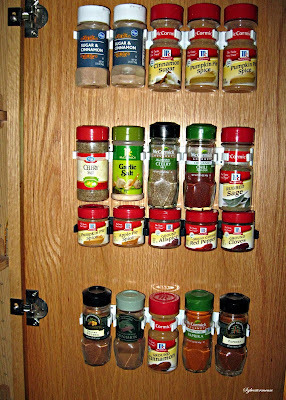 This is one recipe card that I had to add to my own personal recipe binder! 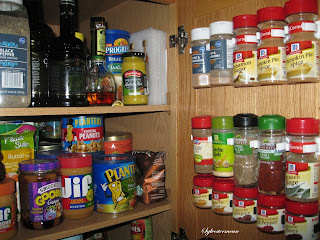 Susan originally published her recipe on Hubpages. 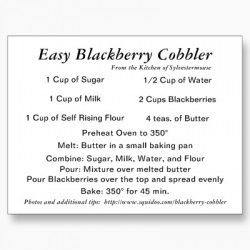 This is my own recipe for Blackberry Cobbler. The recipe was passed down from my mother, who happens to be my all time favorite cook. Mom knows how to make the best of everything! Our recipe for Blackberry Cobbler is quite delicious, as well as easy to make. 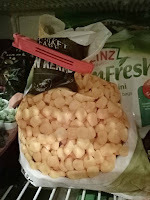 The associated article is also currently published on CookingfortheHolidays.com where I show a step by step photo tutorial. The recipe is so easy that the photo tutorial is not really necessary, but it is still fun to look at. Be sure you watch for the featured mouse! These cookies are definitely a "savor the flavor" cookie! 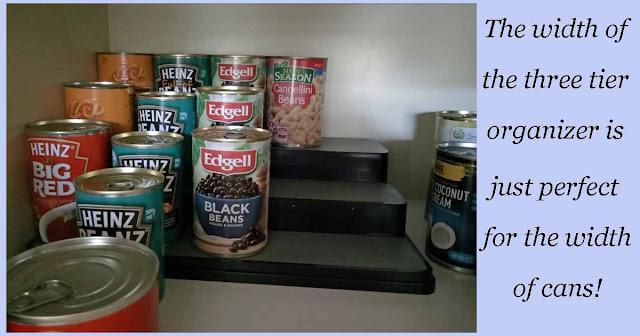 I know you will love this recipe as much as I do. Oh, perhaps I should tell you what a delicious companion these lemon cookies are with a cup of coffee. They make the perfect combination of hot, sweet and delectable. The associated article on Mary Beth's lemon cookies can be found on Hubpages by simply clicking this link. 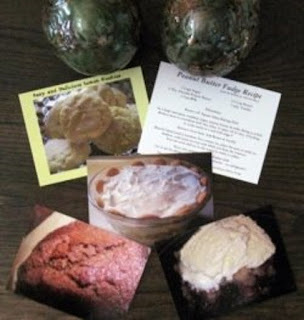 Here are a few more recipe cards that I personally offer on Zazzle. The Peach Cobbler recipe is a real crowd pleaser and the Peanut Butter Fudge recipe makes the best ever fudge! Both of these recipes are from my own family recipe binder. They were also given to me by my mother and are true family traditions in our homes. 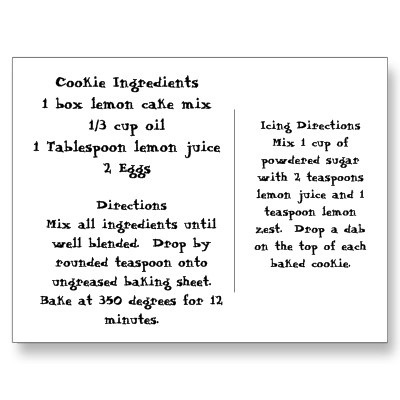 Creating your own recipe cards on Zazzle is actually very easy. 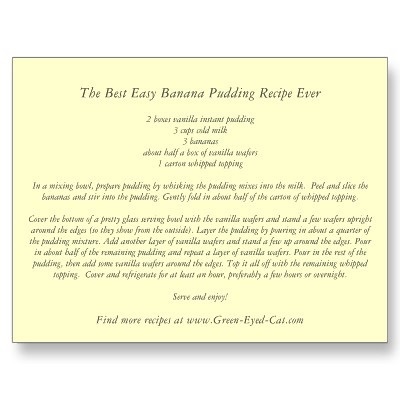 You simply choose to "create a postcard", add the photo of the food on the front and the recipe on the back. As you can see, we each chose different fonts when we made our recipe cards. You select the font that you think looks the best or that is most legible. 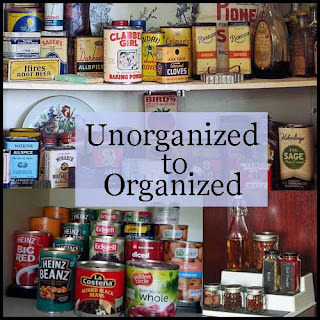 You do not have to offer your recipe cards for sale on Zazzle to create and purchase your own recipe cards for your personal use.